I'm not sure exactly when I became aware of the Cape Romano Dome Home, but one thing is for sure: I haven't been able to get it out of my head since. I knew I needed to go... the sooner the better, as there's no telling how long the domes will be around. They are like something out of a dream, a post-apocalyptic movie set, other-worldly… However you might describe them, they are an amazing sight. 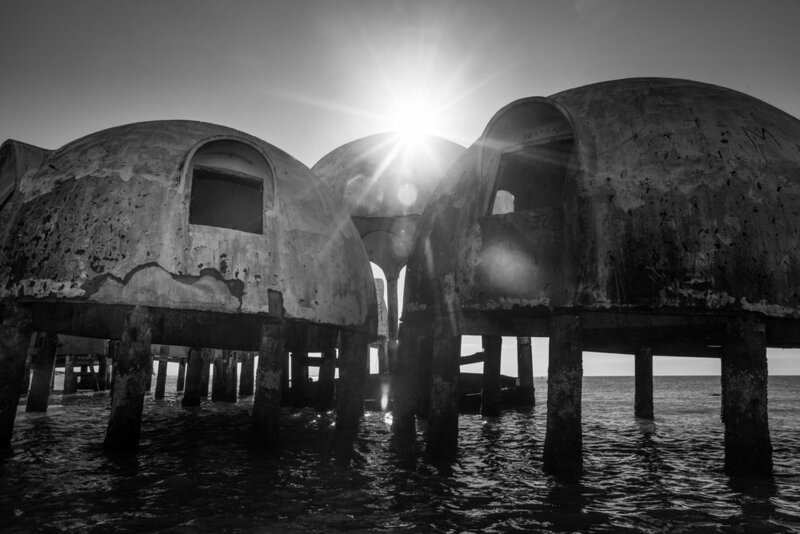 The history of the Dome Home, located just south of Marco Island in Florida, dates back to the eighties. Bob Lee, a retired oil producer, built the structure as a vacation home for his family. Construction began in 1980 and was completed in 1982. The property was sold just two years later. The Lee family came back into possession of the home in 1987, when it became their permanent residence. The family would live in the house until 1992, the year Hurricane Andrew delivered a devastating blow to south Florida. While the home’s exterior structure survived the storm, the interior was destroyed. No one has lived there since. The house was sold to a Naples man with plans to move the structure to higher ground. Damage from Hurricane Wilma (as well as permitting issues) put a stop to those plans. The storms had eroded the land beneath the domes and over time, the stretch of beach upon which they stood would cease to exist (a Google image search provides a pretty good history of the dome home’s march into the sea). 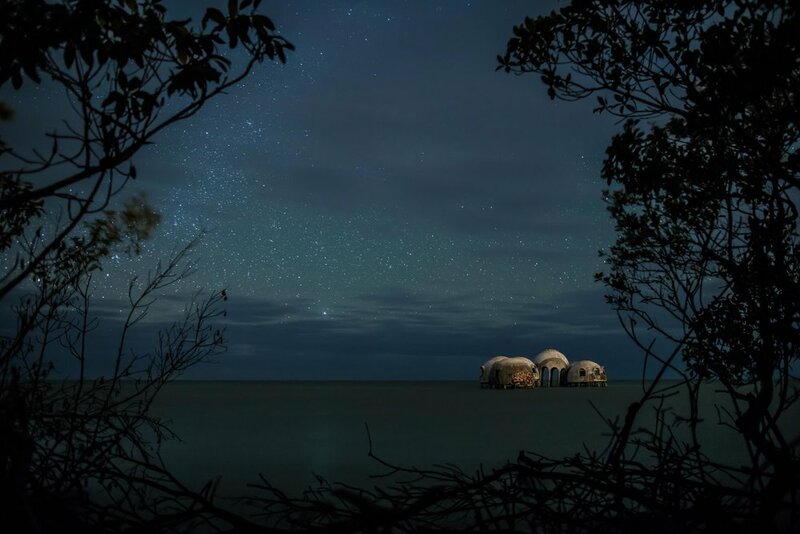 Fast forward to 2016… this would be my year to visit Cape Romano and see the fabled home. My plan was to produce a short time-lapse film featuring the ruins (which you can view at the bottom of this page). I ended up making three separate trips to get the shots I needed. It’s worth mentioning, spending extended periods of time on Cape Romano can be challenging. The first trip out it was cold and, due to a rushed departure, I was ill-prepared. Arriving at the Calusa Marina in Goodland at 5pm, I had very little time to paddle out to the cape in my fully loaded tandem kayak. The sun was due to set at 6:24 that night and I had 5 miles to travel. Not wanting to be paddling the Ten Thousand Islands after dark, I kept up a brutal pace to reach my destination by sunset (I just made it in time to shoot the setting sun behind the dome home). The following visits were a bit easier, as I had the luxury of past experience to help me plan a little better each time. If you plan on visiting Cape Romano yourself, let me share some of the lessons I learned from my visits: If you’re going to paddle out there, depending on which route you take (if you are launching from Goodland), you’re looking at a 5 to 7 mile paddle. The winds in this area can be strong. Each time I visited (in March and April) I had to deal with 15-20mph[Shooting time lapse footage on Cape Romano] winds (not fun when you’re paddling into the wind). If you choose to take a power boat, there are different challenges. The currents at the cape are extreme and the difference between low and high tide can be as much as 6 feet. If you’re not paying attention, your boat could end up high-and-dry within a couple of hours. You can camp on the beach at the cape, but be sure to keep close tabs on weather conditions. You do not want to be camping on this barrier island in a storm! I would also highly discourage camping any time of year other than winter. The bugs are relentless after dark. My third trip was in April and we were pestered by swarms of mosquitos, even out on the beach with a stiff wind. Long story short, Cape Romano is an extreme environment that bears the full brunt of the elements… so plan accordingly. Getting the shots: The time lapse film (below) involved 3 overnight trips to the site and thousands of images to compile.